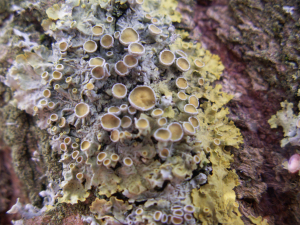 Observation - White and yellow lichen - UK and Ireland. Description: Mostly white with yellow edge to lichen. The fruiting body has a white cup, but yellow centre. Mostly white with yellow edge to lichen. The fruiting body has a white cup, but yellow centre.